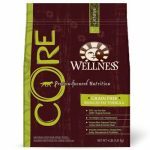 Online Wellness dog food coupons can help you save money on a dog food formulated with antioxidants, pre and probiotics, and omega fatty acids. They believe in only using ingredients that provide a natural balanced food, with no wheat, soy, corn, or artificial colors and flavors. This combination of ingredients ensures that your dog gets the natural nutrition she needs to live a long and healthy life. Wellness is another company with over 8 decades of providing quality pet food behind it. It began in Gloucester, Massachusetts, producing only dog biscuits, and has since expanded and now calls Lowell, Massachusetts home. The recipes for their current dog food were introduced in 1997. Like most pet food companies with long histories, you can expect to pay a little bit more for Wellness dog food. However, printable Wellness coupons can give your pet more balanced nutrition for the price. As they say, a penny saved is a penny earned.